Today is Inauguration Day, and I know of quite a few people who are celebrating the occasion with parties and (naturally!) 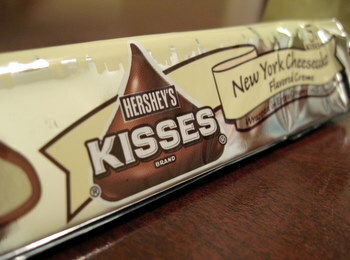 with snacks. My all-American favorites are chocolate chip cookies and double crust apple pie, and I certainly think they’re good choices if you want to bake something. I tend to save my red-white-and-blue creations for 4th of July celebrations, but this seems like a good time to make an exception and to bring out some of my more patriotic looking recipes. Mixed Berry and Ricotta Babycakes are like miniature cheesecakes studded with red and blue berries. They can be made with fresh or frozen berries. Red Velvet Cake Sandwich Cookies are a takeoff on classic whoopie pies, with a cream cheese filling in the center and a tender red velvet cake serving as each end of the sandwich. For something really overtly patriotic, a cupcake flag is a good choice. All you need to have on hand before arranging your favorite flavor of cupcakes into a large rectangle is red, white and blue frosting (or sprinkles). 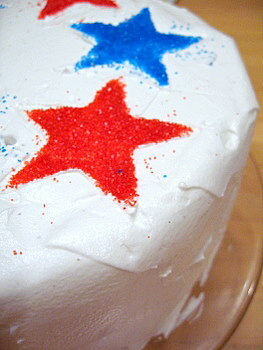 The frosting can be added on to the cakes to mimic the colors and pattern of the flag. Finally, a little touch of red and blue will go a long way on any frosting. I made star shaped cake stencils out of a stiff piece of paper used colored sanding sugars on white frosting to create the bold stars on the cake pictured above. Oh this is great! I’m going to add the link to my Inauguration Roundup. Thanks so much for sharing! i made your cupcake flag, and everybody loved it! Thanks for the great ideas! I do have an Inauguration Party to go to and I had no idea of what I was going to take! I think I’ll make the cupcake flag! i had a meeting on tuesday and the coordinator got a huge strawberry cream cake with a picture of obama on the top (it was one of those picture cakes)…not homemade, but certainly creative and delicious!